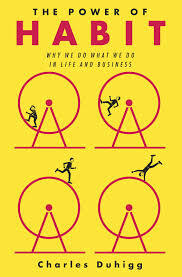 The Power of Habit: Why We Do What We Do In Life And Business by Charles Duhigg was a fun behavioral econ read about how our brains turn one-time decisions into repeated behaviors, and how that can be manipulated or optimized—for ourselves, organizations, and society. 40% of our actions are the result of habits, and not conscious decisions—so it’s wise to think about what we spend a lot of doing and not thinking about. I have some minor gripes with the book. Duhigg goes off the rails in applying the habit framework. Instead of interpreting clearly identifiable habits, he applies it to behaviors and trends that strain the definition (like the civil rights movement). The book suffers from that condition of a hammer, to whom everything looks like a nail. To this guy writing about habits, everything looks like a habit. Habits have a 3-part structure: Our brains form habits as a means to conserving effort. I once exerted precious brain-energy to actively seek out some sweet fresh morning bakery. Now I just automatically make a bakery stop on the way back from my Crossfit workout. (The brain is good at habit formation, not so good at mitigating cognitive dissonance.) The habit structure is as follows: 1. the cue (I’ve finished my sweaty morning workout); 2. the routine (I eat a sugary baked treat); 3. the reward (I exalt in the sugar-endorphin haze). It’s more effective to tweak an existing bad habit than it is to eliminate it: When it comes to the self-help portion of the book, there’s no new age (and grammatically incoherent) talk of being “more present” in our actions. Duhigg accepts habit formation as inevitable. Such brain-energy-saving strategies are how our brains are able to function. I could try to just stop wolfing down pain au chocolats in my sweaty gym cloths, but that’s unlikely to work. Once a habit is formed, it’s difficult to eliminate altogether. It’s more effective to tweak the unwanted routine part of the “habit loop.” This is how Alcoholics Anonymous can be effective. For many alcoholics, it’s not the drunkenness that’s their reward, but the bar-room social interactions that accompanies it. So AA responds to the loneliness cue that might compel one to a bar by replacing the evening drinking routine with an evening meeting routine, while generating the same social reward. 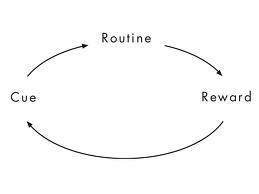 However, this takes an acute awareness of the cues and rewards that drive a habit, which isn’t immediately evident. For my post-workout bakery routine, is my cue the workout? Should I really stop blasting my quads? Is my reward really the sugar-endorphin buzz? Some helpful suggestions are posed on how I might go about figuring this out.